Fold Hill Classic Working Dog is a nutritionally tailored diet for active or working dogs, containing carefully selected ingredients to accommodate the high energy demands of maintaining an active lifestyle. The food combines a delicious and nutritious blend of essential proteins, carbohydrates and dietary fibres to promote the health and strength of muscles, the growth of good bacteria in the gut, the health and hygiene of the oral environment and to aid in the digestive process. Additional fats and oils will nourish and protect from the inside out, whilst helping to promote the condition and shine of your dog's skin and coat. Digestible and palatable to appeal to even the fussiest appetites. Cereals (4% Rice in the component with Rice), Meat and Animal Derivatives (4% Beef in the component with Beef), Derivatives of Vegetable Origin, Oils and Fats, Vegetables (4% Pea in the component with Pea, 4% Carrot in the component with Carrot), Minerals, Various Sugars. Cereals (4% Rice in the component with Rice), Meat and Animal Derivatives (4% Chicken in the component with Chicken), Derivatives of Vegetable Origin, Oils and Fats, Vegetables (4% Pea in the component with Pea, 4% Carrot in the component with Carrot), Minerals, Various Sugars. Cereals, Meat and Animal Derivatives (4% chicken), Oils & Fats, Minerals. 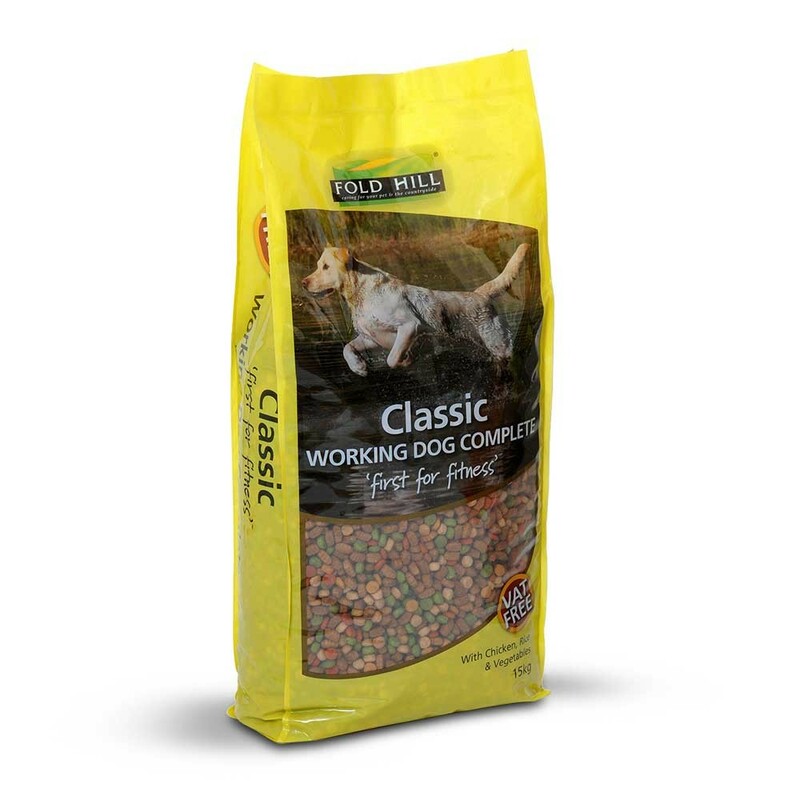 There are currently no questions for Fold Hill Classic Working Dog Food - be the first to ask one!